In my search for up-to-date tutorials on connecting sensors to Processing I found a few valuable threads. They are clear, the code is GPL, the aesthetics are – well I guess not my taste – but opinions are very easy to get by – good tutorials – less easy to find (=a critical compliment). Jeremy goes a step further than the usual Hello World “Blink a led sketch”. I didn’t do what he does at 20 years old. In tutorial 6 he already goes from receiving information from a sensor to sending out serial information for Processing to receive. Tutorial 7 continues on this visualizing sensor information thread. Found through the use of a search engine and this blogpost. 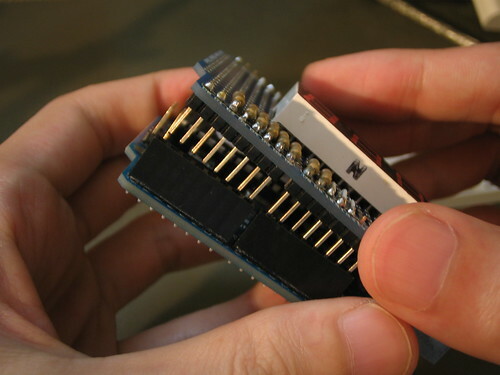 For quite a few of the Ellentriek#11 projects, participants wanted to connect Arduino to the main current system: 220 Volt. As this can be tricky, it’s good to look for solid solutions. I have found a relay set-up which is safe to use with 220 volt and arduino (yeay!). and you need of course to add all the components. The transistor and diode are essential for safety (making sure that the current only goes into one direction). I buy all my Sparkfun stuff here, which makes sure that you avoid the international shipping costs and the US taxes. I want to visualize some date from real world sensors to my computer – they are self-made variable resistors. For this I need to flash software on the Arduino chip, have the right libraries and use particular sketches in Processing. 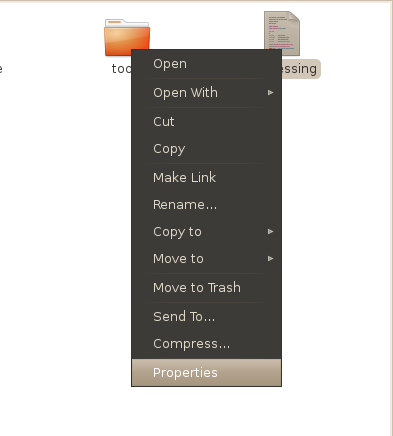 You can choose for adding Arduino to your repositories, or you can install the software manually. These introductory films give you a clear insight into this construction, on how the microcontroller counts on a library and how the software depends on that too . They do however bluntly tell you that, when you work with Linux, you are on your own.. Boo! 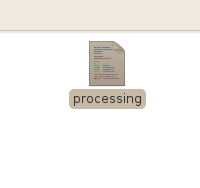 The Arduino playground wiki is a bit confusing, but it does complement the video and one of the errors I got kindly referred me to the Processing wiki. 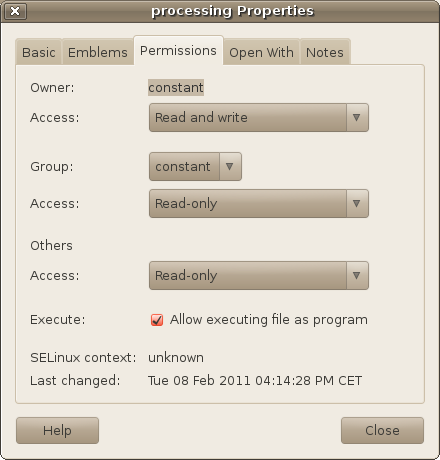 – Processing needs Java – if you are running Ubuntu: here I found the best tips. – Apparently Compiz – fancy 3D graphics – can give you trouble – so it’s best to turn it off. – Proecssing needs Java -> you need to choose between OpenJDK of Sun Java -> when you choose Open JDK, you always get this error when you start Processing. It does work! – The next tutorial I’m following is Arduino meets Processing, physical computing and computer graphics, which dates from 2005, so I’ll check the strength of their tutorial (6 years old seems like an eternity in tutorialland…). ** Update ** This tutorial is outdated! Go Arduino, Processing and sensors 2 for more up-to-date links.